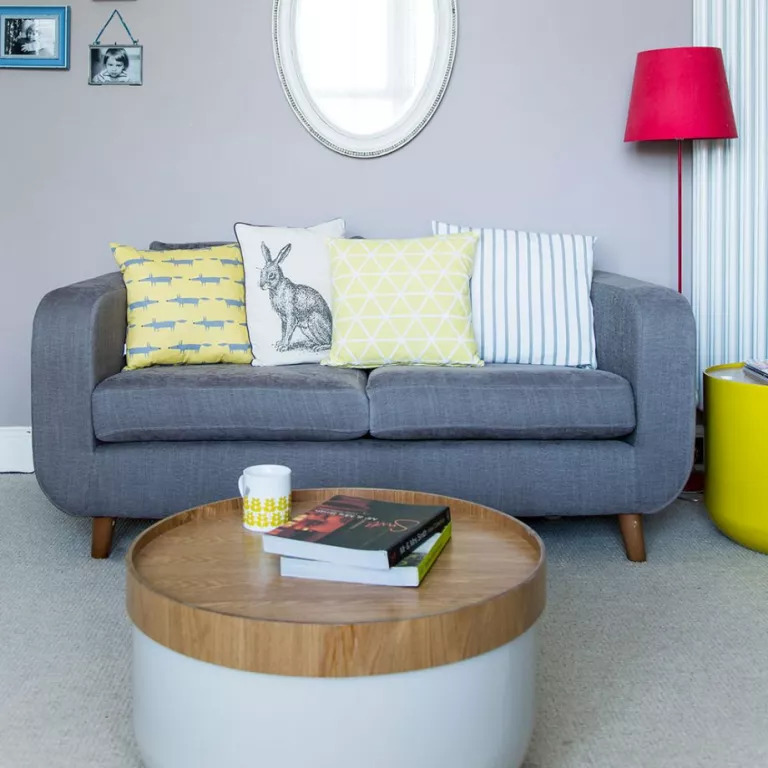 If you are looking for small living room ideas, take inspiration from our gallery of beautiful small space designs to unlock the potential of your compact living room. Take a look at these small living room ideas to get you started. The first thing you should never do if you have a small living room is cram in too much furniture. Instead, choose a sofa that’s proportional to the size of the space, and if you’re still in need of more seating, use stools. They’ll take up far less room than bulky armchairs, and can be easily manoeuvred. 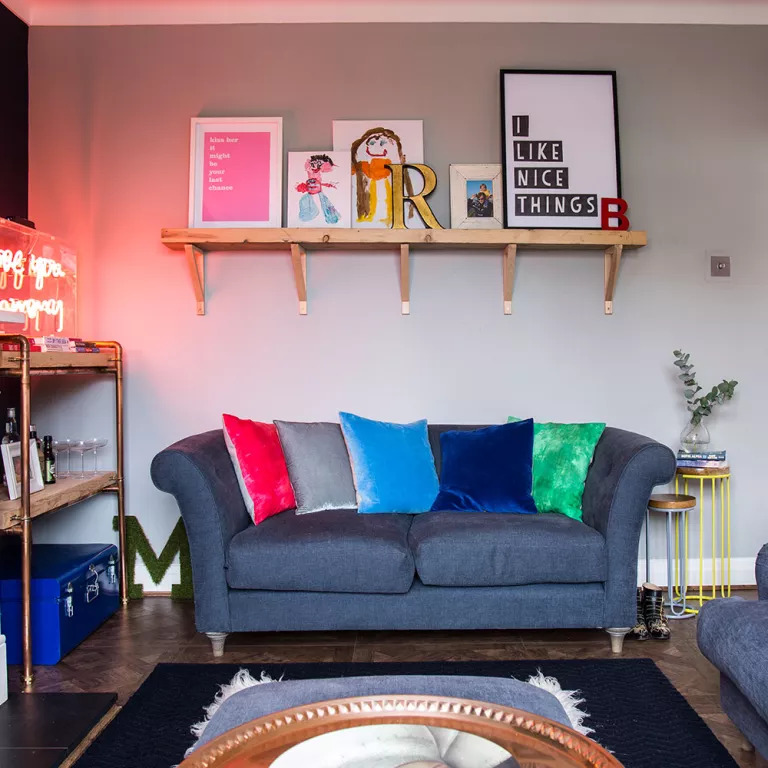 If you like your living room cute and cosy, try clustering colour-co-ordinated objects together – from pictures to cushions – to create a coherent look. Make the most of natural light in the room by keeping window dressings simple. If you are lucky enough to have high ceilings, full-length curtains are a good choice as they’ll draw the eye upwards and create the illusion of space, even if the square footage in your living room is a bit meagre. Subtle stripe designs add to the feeling of extra depth. If you do choose curtains, make sure they can be swept away from the window for light or alternatively go for Roman or roller blinds. When it comes to small living rooms, hard-working, multi-functional pieces of furniture are your friends. Take this coffee table, which doubles as a storage bin, allowing you to clear away any clutter at a moment’s notice. You could also invest in lidded stools, or even a sofa with storage under the seat. Add wall mirrors and furniture with reflective surfaces into your design scheme to maximise the amount of natural light in your living room to make it feel bigger and brighter. 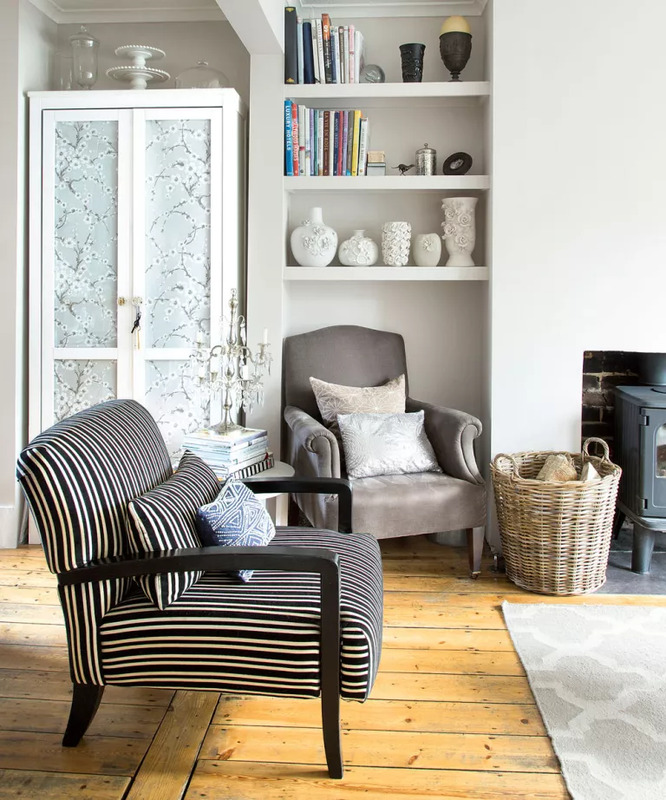 Whether it’s a bijou country cottage or a studio flat, it can be tricky to create a relaxing bolt hole when your front door opens straight into your living room. Take the emphasis away from the entrance by creating a focal point with thoughtfully arranged seating. Here, a neat two-seater and comfy armchair have been placed at a 90-degree angle to a slim side table and lamp. A cool neutral palette works beautifully with the rustic plasterwork and the roller blind makes the most of a recessed window to add extra square inches to the room. Think about living room wallpaper designs to complement your lounge. Take that décor up high when floor space is limited. Here, a small corner of a brilliant white room has been transformed with a column of geometric pattern that pulls the eye upwards to make the most of a high ceiling. The pattern is echoed at the window in a sheer voile, which allows the natural light to filter in for a clean and bright effect. The neat base of a marble floor lamp negates the need for a side table while providing great task lighting for when the sun sets. Think about alternatives to traditional living room furniture, such as the three-piece suite. It’s still possible to have a cosy area for relaxing and reading with less space-greedy furnishings. 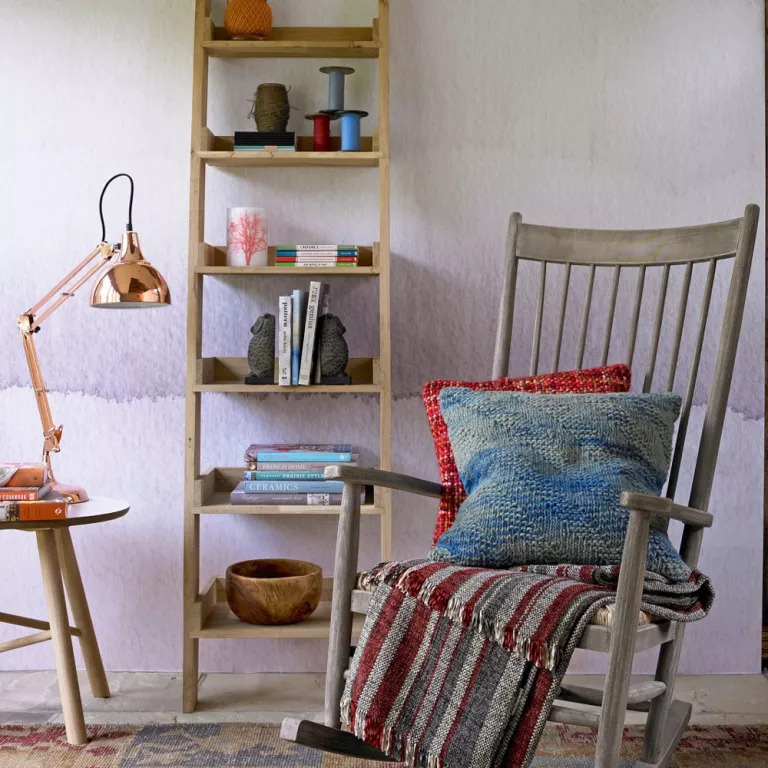 Swap an upholstered armchair for a wooden rocker with cushions; and bookcases for slimline ladder-style shelving. Wash walls and accessorise with subtle colour. Before decorating or furnishing an awkwardly shaped living room consider how best to optimise the space available. Think about an L-shaped sofa in a tight eaves space teamed with trunks that can function as coffee tables as well as handy storage. Keep a dark room white to make the most of what little light there is. Decorating with white on walls, ceiling and floor can leave a space feeling clinical and stark. 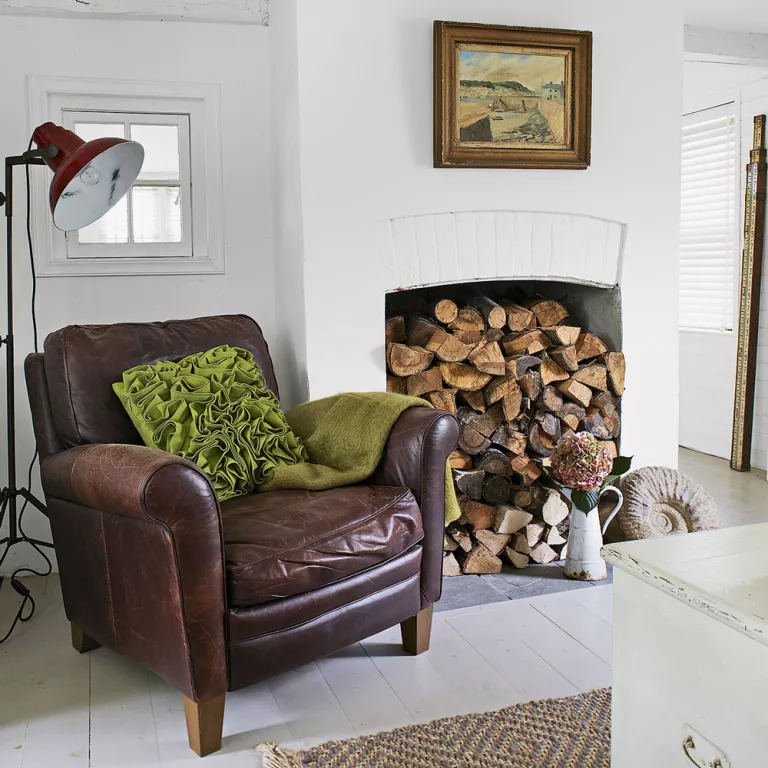 Take the chill off a compact nook with a homely leather armchair, red floor lamp and woollen rug – all circled around a log-filled fireplace. A tactile cushion and soft throw in viridian green add a final designer touch. Mark out a living space with an overhanging pendant light and carefully positioned round coffee table. The two pieces work together to create a focal point around which you can sit a couple of chairs and add floor cushions or stools when guests visit. Here, a selection of accessories and books are displayed on industrial-style open shelving to create a relaxed feel without hiding the beautiful texture of a slate feature wall. Just because your living room is verging on the small side, it doesn’t mean that you should hide away all your favourite belongings in storage. If you have objects that are worthy of showing off then display them along an open shelf, above the sofa. This idea is great for when floor space is at a premium. Give a white room heaps of character and personality by adorning it with artwork that you just can’t live without. A crisp, clear wall is a good backdrop for styling with colourful accessories and won’t make the space feel cluttered. Keep to a palette of one or two colours to keep the look consistent and cohesive. Pattern can work as well in small living rooms as it does in large, but it pays to think carefully about where you put it. 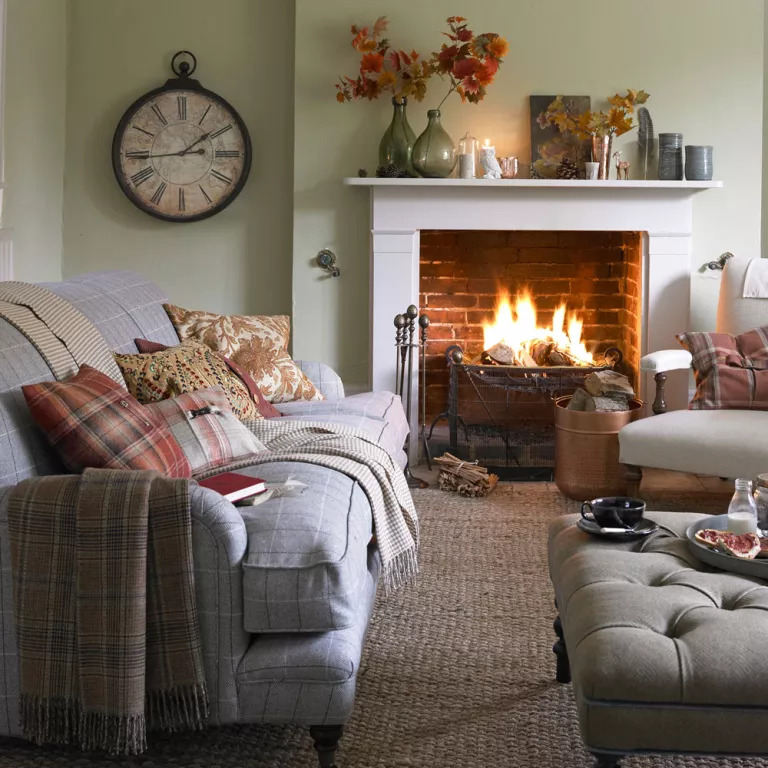 Wool fabrics are made for cosy country-style firesides, but keep tartans, checks, paisleys and florals confined to throws and cushions on sofas and armchairs, leaving walls for plain paint finishes. Add a natural flooring rug to bring the two sides of a room together. 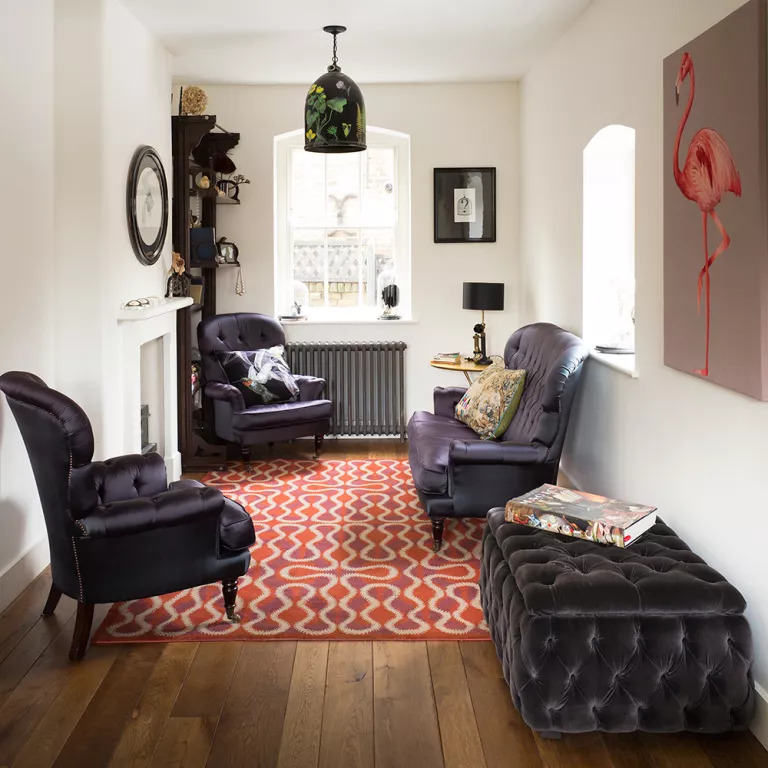 While banishing clutter might help a smaller living room feel more open, if you’re a fan of the cosy, lived-in look such a pared back scheme will do little for you. But small doesn’t have to mean bare and characterless. Try the classic combination of dark leather armchair and traditional fireplace – there’s nothing like it for creating a warm, cosy environment. Add much-loved items and accessories – in an interesting, character-filled scheme, no one will be thinking about how small the room is. Make the most of the unused space under the stairs by incorporating everything from storage to quirky accessories. 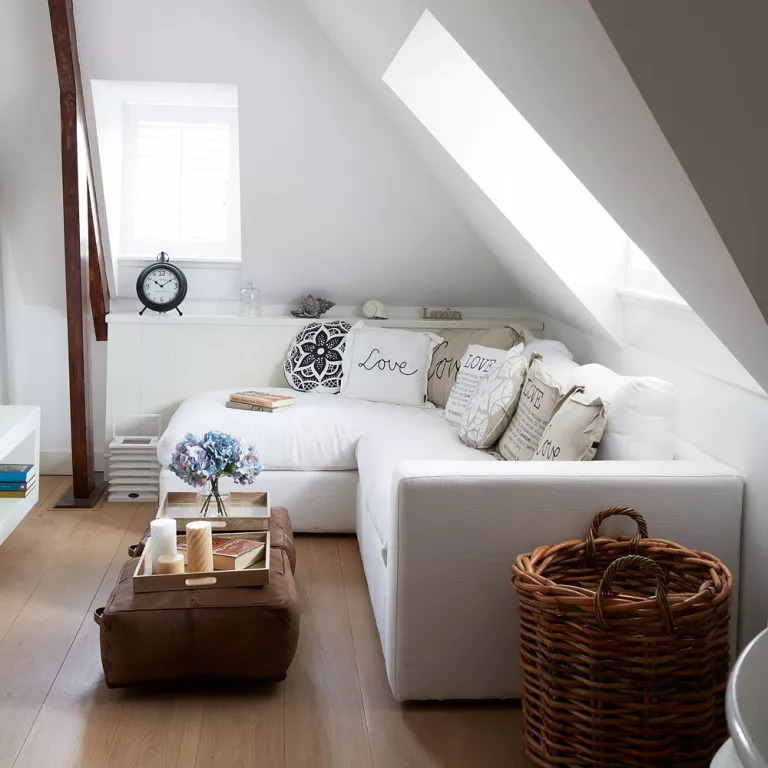 If you have space issues in your small abode and need to make the most of every nook and cranny then turn to that nimble spot under the stairs into a warm and cosy living space. Here, a built-in bookcase and sofa tucks in neatly in that often unloved and underused area. Give architectural features a modern update with a fresh coat of paint and light retouching. Here original features have been painted to give this living room a modern edge. 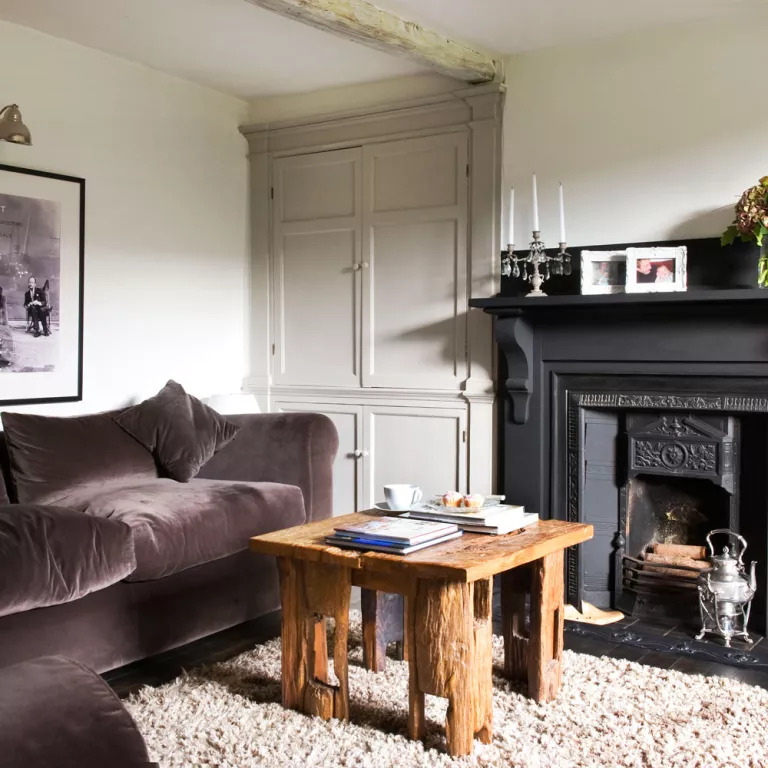 The black fireplace remains the focal point, and adds a sense of cosiness along with the chunky sofa and rustic wooden coffee table. A wool rug brings texture to the scheme and enhances the inviting feel of the room. Small living rooms need to be kept fresh and uncluttered with well-chosen storage. A great way to make a small living room feel larger is to keep it meticulously tidy and in order to do that, everything in the room needs to have its proper place. Floating shelves are perfect for small rooms because they can hold a lot of things on a wall or in alcoves, or choose bespoke fitted, floor-to-ceiling shelves and cupboards that make use of every inch of spare space.